Smoky flavours of roasted Red bell peppers combined with a hint of Garlic,a burst of Lemon juice and Olive oil mingle together to make up this delightful Middle Eastern Meze. 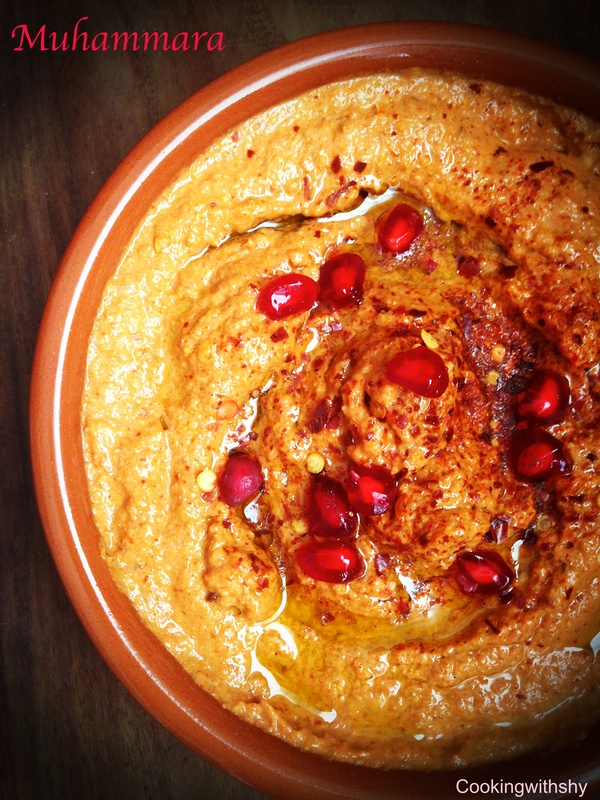 If your taste buds are sharp enough you will detect the coarse texture that is brought about by the addition of breadcrumbs and coarsely ground walnuts to this dip.Tracing its origins to Syria,this is now a popular accompaniment with most Levantine cuisine. I’ve been shying away from making up this favourite dip of mine due to the lack of being able to source Pomegranate Molasses which I feel is an essential ingredient.I do believe the brilliant red tones and the tartness in a Muhamarra are certainly lent by the molasses.I’ve been impatient to make this and went along by substituting with some honey. Verdict: I was very pleased with the outcome in terms of the texture and flavours.However I would love to get my hands on a bottle of the Pomegranate Molasses or perhaps even make some myself. Do you experiment with substituting a key ingredient in a recipe? Would love to hear about an experiment from your kitchen. Do share your thoughts. Heat the oven to 200 C. Lay the washed red peppers on a baking tray and drizzle with some oil. Roast them for about 30-35 minutes. Remove the charred skin and de seed the peppers.Using a mortar and pestle,crush the peppers to a pulpy mass. Mix together the breadcrumbs,garlic,paprika,chilli flakes and cumin in a mixer. Add the above to the red bell pepper mixture. Mix well and add in the honey,lemon juice,salt vinegar and brown sugar. Add in the ground walnuts. looks delicious, will definitely try this ! I can’t wait to give this a try…it sounds different and delicious. I’m pretty sure that I can get the molasses.